‘High in his attic bedroom, twelve-year-old David mourns the death of his mother, with only the books on his shelf for company. But those books have begun to whisper to him in the darkness. Angry and alone, he takes refuge in his imagination and soon finds that reality and fantasy have begun to meld. While his family falls apart around him, David is violently propelled into a world that is a strange reflection of his own — populated by heroes and monsters and ruled by a faded king who keeps his secrets in a mysterious book, The Book of Lost Things. Anybody who knows me knows as I am obsessed with fairy-tale retellings especially when there is a really cool twist involved, so I absolutely devoured The Book of Lost Things!! Our hero is David, who has just lost his mother. His father has recently re-married and had another child so David is understandably grief stricken, traumatised and feels a little hard done by. I really empathised with David, he felt so alone and had a great deal of anger towards his step mother and baby brother, Georgie because obviously if you have a kid with someone else just after your wife has died, your son might be angry! I loved that the story was set in WWII – I thought that it really mirrored the destruction of David’s life as he knew it. I also love that he loved books and fairy-tales – a kid after my own heart! David’s journey begins when he starts to hear books whisper, when he starts to black out and when he hears a mysterious tale about a boy and his sister that went missing years before. When a German plane crashes in the middle of the night David creeps out of his bed and through the crack in the wall where he discovers a whole new world. He is greeted by the Huntsman who takes him back to his heavily guarded cottage in the middle of the wood, pursued by the Loups, kind of half wolf half man creatures. This Loup’s were made by Red Riding Hood mating with a wolf and have the viciousness of wolf’s and the intelligence of humans. The huntsman explains that the only way for David to get home is to travel to the King who is rumoured to have a magic book: The Book of Lost Things. So David travels to the King, and on the way meets some communist dwarfs, a fat and rude Snow White, a lovelorn soldier called Roland. The terrifying villain is the mysterious Crooked Man who is adamant that David meet the King. The ending of this novel is so unexpected and so horrifying and I loved it. Its not often that I am shocked by an ending but I really was here and it just made the novel that much better. I don’t want to say anything about the ending because its just too good to spoil!! The Book of Lost Things was one of the best books I have read all year. Don’t be fooled by the child protagonist, this is NOT a children’s book. It is extremely dark -which is exactly how I like my fairy-tales! Disney like fairy stories this is not, it tackles issues of death head on. 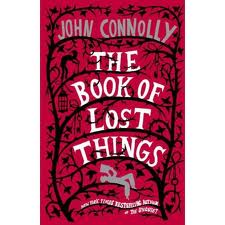 I have never read anything by John Connolly before but he writes beautifully and it takes a great writer to transform some of the most well known and well loved fairy-tales into these twisted and dark versions of themselves and yet write a thoroughly original piece of work. I definitely recommend this book if you like dark fantasy and fairy-tales. I am currently half way through Anna Dressed In Blood at the moment, which I am also loving – I have really hit a good streak with books lately – its like Christmas come early! Speaking of Christmas, is anybody else really excited this year? I have been begging my ma and pa to put up the decorations and listening to Xmas songs non stop! I loved Anna DIB! This books sounds really fun, I am listing it! Great review!